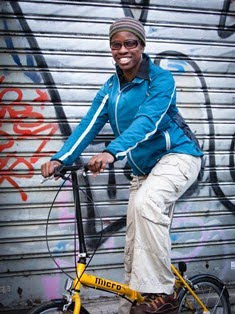 2Wheel Chick: Somme bike ride! 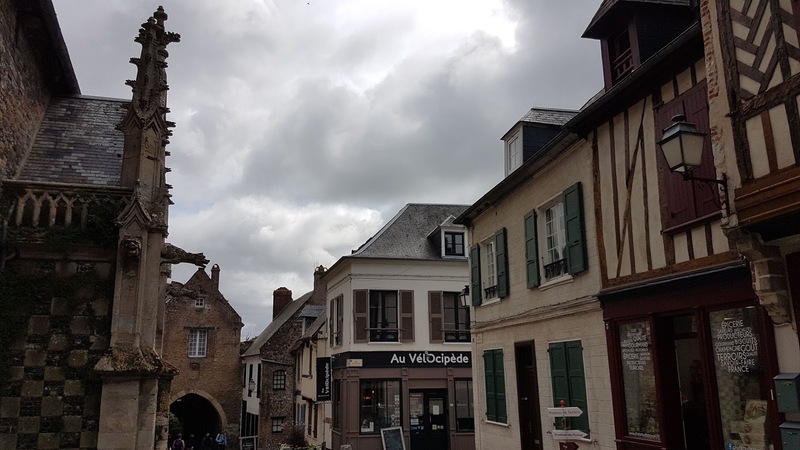 My plan had been to ride from Abbeville to Compiègne, but because I hadn't managed to ride around the lovely medieval town of Saint Valéry sur Somme the previous day I wanted to get that in first before advancing further inland. It wasn't going to take long to get back to the coast, as Saint Valéry was only 11 miles away, and there was a convenient cycle path along the river to use as well. So I set off from my lodgings, a nice studio apartment (La Vie est Belle) in the centre of Abbeville. A few chores I had to do got in the way and I ended up hitting the road at almost lunchtime. I didn't take the canal path to get to Saint Valéry, preferring to save that for the return journey to Abbeville, while going along the road on my outward ride to the coastal town. In fact the roads might as well have been traffic-free given that once I was on the D3 from a village called Cambron there were hardly any vehicles. It was a very quaint sleepy village with practically no one around. Further along the road were a few cows that looked a bit startled to see any other form of life passing by! The country lane undulated and twisted and turned through woods, and although the general direction was towards the sea, there was hardly any sign of it. It wasn't until after I reached the roundabout approaching Saint Valéry sur Somme that the coast came into view. Saint Valéry was a very touristic place, as you would imagine. People were headed just for the main feature, the medieval city, making the paths crowded so on the bike it was a bit of a faff getting round everyone. There was a road, but it was cobbley, and with the load on my bike I think that would have been a bit too much for the frame as well as my bones! To visit all of the medieval city you need to have lots of energy and comfortable shoes for the uphills as Saint Valéry is set on different levels. I had neither. What energy I had was being saved for my ride to Mont Didier, near Compiègne. So my visit was confined to the highest point I could feasibly ride to, which was conveniently near an old church, the Eglise Saint-Martin, and a café thematically named Au Velocipède. Although this wasn't the very top of the town where the abbey is situated I was still high enough to get a panoramic view across the bay, where Le Crotoy was situated. That town had been on my list of places to visit, but time had run out, so a visit to Le Crotoy would have to be for another day. Seeing as it was now afternoon I made a beeline through the town to try and pick up the cycle path back to Abbeville. This is where I wasted a lot of time. I couldn't seem to find the start of the path, and at one point I joined the main N940 road and ended up cycling over it, feeling a massively frustrated as flew over the bike riders below me, not knowing how to join them. It took me almost an hour of faffing around in Saint Valéry before I was able to join the path. It was a relief to see the sign and know I was finally on the right track and I could look forward to getting back to Abbeville, grabbing a bit of lunch, and continuing onwards. This path was really pleasant, with a smooth surface, and regular points to stop for a picnic on the various benches, plus little cafés as the path crossed various hamlets. This path, also part of a Eurovelo network, is popular, with all types of cyclists - organised recreational groups on hybrids, couples, friends, families with children, and club riders looking for a quick work-out. If this cycle path was anything to go by I would be in for a treat on the section along the River Somme to Amiens, as that would be a meandering path through woodland, as opposed to this path which was completely straight along a canal. The route from Saint Valéry to Abbeville was 15km (9.5 miles) so it wouldn't be long before I would be stopping for lunch and a photo opportunity at the big church. Unfortunately, things didn't go to plan, when I got a puncture about 3 miles from Abbeville. What a heartsink moment when you know that even though you can sort it out, it is nevertheless going to delay you further. Also I never feel confident that I can pump up my tyres to sufficiently - particularly when I need high pressures to support my ever expanding panniers! Well, my worries about pumping up tyres just got worse when I took out my pump only to discover the piece to attach it to the valve had snapped off (God knows how) so I had no pump at all! Feeling somewhat folorn, I reattached the back wheel to the bike, reloaded the panniers onto the rack, and then wheeled everything, with difficulty to the nearby cafe. Although there were lots of cyclists riding by I didn't feel comfortable interrupting their rides to borrow their pump so I preferred to see if either the café owner or a cyclist on their café stop could help me. Luckily that worked, and I was able to get a pump from two Belgian women who were cycle touring. Just to be sure that I wouldn't have further problems I got a new rear tyre fitted, as I realised it was a little worn and I just didn't want to take any risks. By the time all this was done though, it was going to 5pm, the sky was looking threatening, and I wasn't sure if I really wanted to ride in what could be a heavy storm. Perhaps I could just ride to Amiens and then catch the train. Looking at the timetable, the train would leave Amiens for Compiègne, where I was headed, at 7.30pm, and according to Google it would take me 2 hours 30 to cycle to Amiens. They guys in the bike shop reckoned it would take an hour and a half, but they also mentioned that part of the cycle path was closed, and I would need to take a diversion via Eaucourt and Pont-Remy, but if I could ride at 25 kmph (16 mph) I would be fine. I wasn't sure I could average anywhere near that speed on undulating ground, and I often stop to consult the map on these rides. It would be touch and go as to whether I could reach Amiens by 7.30pm. The train after that would be at 8.30pm, meaning I would get to my lodgings in Compiègne at almost 10pm. Not what I wanted. I didn't want to do a stressful ride where I would be up against the clock either. This was meant to be a holiday after all. Perhaps I could do a leisurely ride up to a village called Longpré, pick up a train from there, change at Amiens, and then get another train for Compiègne. In fact that was my intention. But when I saw that there had been heavy rain in Eaucourt and the sky still looked threatening that made me change my mind about cycling over there, and return to Abbeville from where I could get the train. It is wasn't really what I wanted to do but I feel it is always important to travel in a way where you have a fall-back plan. So my cycle ride ended just outside Abbeville, with less than 60 km on the counter, and not much further along the road through France than I was at the start of the day. 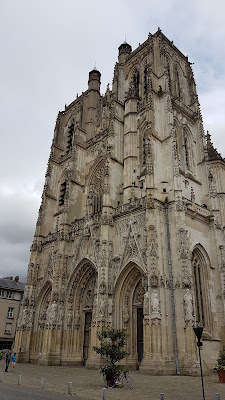 There was no pleasant ride along the River Somme, no chance to see the wonderful cathedral at Amiens, and no regal entrance through the Compiègne forest into the former royal town. It really felt like a wasted day. I really hate that feeling of having missed out on seeing something that I had just assumed I would get to see. I had been looking forward to getting to Amiens. Maybe I shouldn't have gone to Saint Valéry, but then that was a place I had really wanted to see too. And in any case why should I have had to choose between the two? It was perfectly possible to ride to both. I wanted to berate myself for not planning properly. And I cursed at the fact that I had packed so much stuff, which had meant that my bike was just too heavy for me to ride at a decent pace. But then again, given that the first part of my day was an out-and-back from Abbeville, I could have left my luggage at my lodgings and then done a quicker load-free ride. Perhaps I should return to the area in a couple of weeks so that I can just ride those parts that I missed. There were so many thoughts going round in my head. My trains got me to Compiègne on time, and I was met by a very friendly, bubbly lady called Véronique who showed me into a rather stylish studio right in the centre of Compiègne (Studio Centre Ville Compiègne). Between that, and arriving to a very picturesque and pretty town, I felt like my day had not been so bad. It was a shame I only got to see Amiens train station, but I have been to Amiens in the past and I am sure I will be there again some time in the not too distant future. Here's the route I did.